Note: This is entry is being re-posted from an old history related blog I used to write, but no longer have the time nor the energy to keep up. 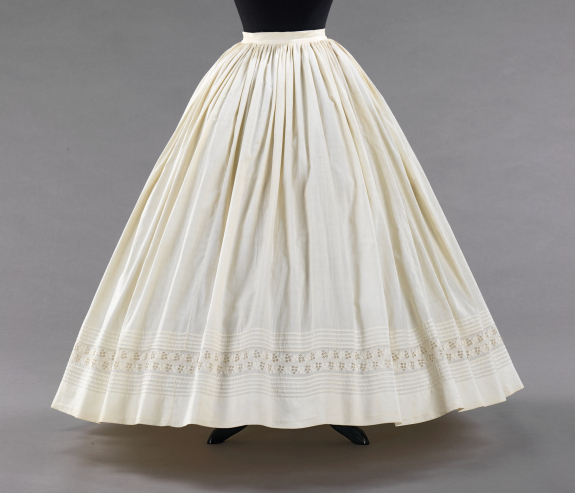 To begin working on my tucked petticoat, I consulted Elizabeth Stewart Clark's article on how to make a basic petticoat. Basic, as in, no tucks. I knew I would have to figure that part out on my own by searching the Sewing Academy forum and good ol' trial and error. There are apparently detailed instructions on tucked petticoats in ESC's book "The Dressmaker's Guide, Second Edition", but alas I work as a historical interpreter earning minimum compensation and cannot afford it. This makes me sad. I also knew that if I wanted to recreate the original tucked petti from the MET I would have to carefully amend a few things in ESC's instructions. I started by studying the original and trying to gauge the ratios used to form the design. When I looked at the tucked area up close, it appeared to me that there are 2 sections of 5- .5 inch tucks, with a .5 inch space in between each tuck. If the tucks are .5 inch, that would make each section including spaces in between 5 inches long. This was important because it also appeared the hem line was just over an equal length, meaning I would have to make the hem deeper that ESC's recommendation of 2.5 inches if I wished for it to appear balanced. 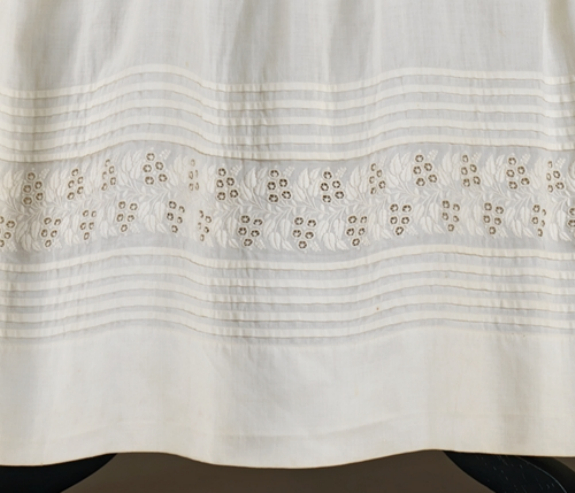 In between the two sections of tucks is a section left untucked but decorated extensively with embroidery. Upon taking my sewing gauge and laying it upon my computer monitor, it was equal in length to each section of tucking, so 5 inches. Just above and below the embroidery is a small span of "blank" space equal in length to one tuck, .5 inch each, making the embroidery section add up to 6 inches total. As I would not be doing the embroidery, I decided to take that middle section and the hemline down to 5 inches to match the tucked sections. It would go 5" hem, 5" of tucks, 5" blank, 5" tucks. I work well with balance. 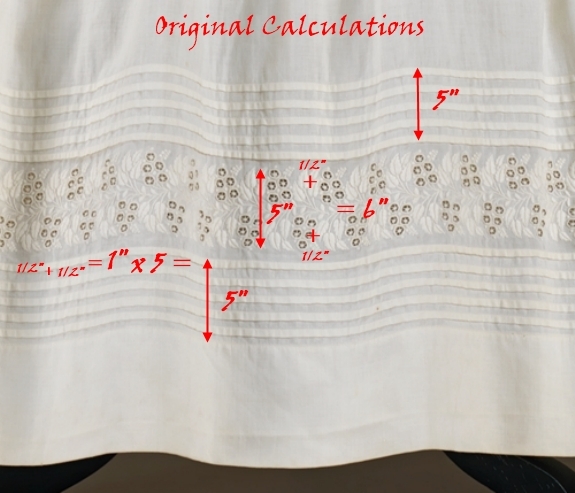 I also decided per her chart that I wanted to make a 4 panel petti, which with my fabric being 44" wide, would bring me to just under 176" in circumference factoring seam allowances. This is on the fuller end of the spectrum when it comes to petticoat circumferences, but I tend to be a tad lofty with my dreams when doing projects like this. I had already pre-washed, dried and ironed my fabric (to minimize shrinkage in the finished garment) so I set to cutting my panels using ESC's ripping method. I then seamed my panels together, leaving about 10" unsewn on the last seam to serve as a placket. I then put in my 5" hem "on the round", meaning as I measured, ironed and pinned my hem line the fabric was being pulled around my ironing board as opposed to being laid straight across had the end panels not been sewn together. I started hemming this way a few months back during a wool petticoat project, but didn't realize there was a term for it. I was so glad to see it mentioned on the Sewing Academy Forum and that it is a recommended way of doing things like hems and tucks. 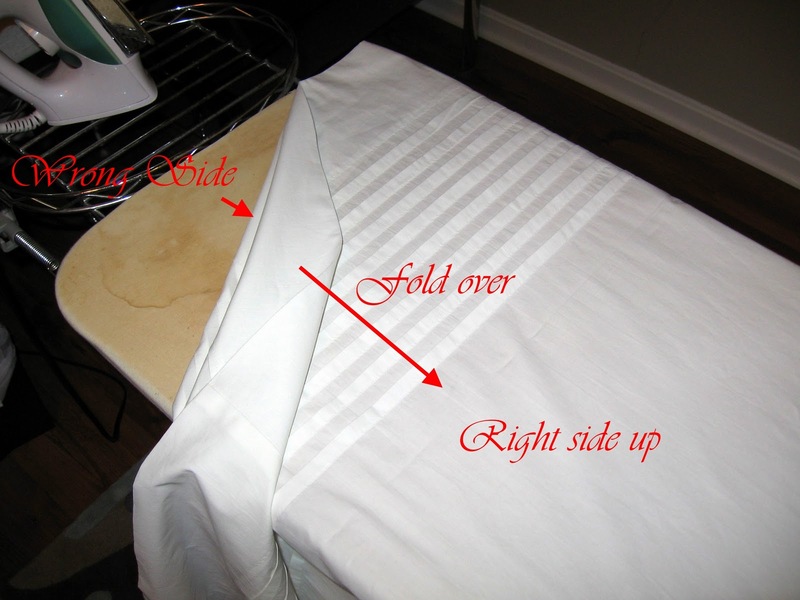 Direction to fold fabric for tucks (my way). Measuring out next tuck length. 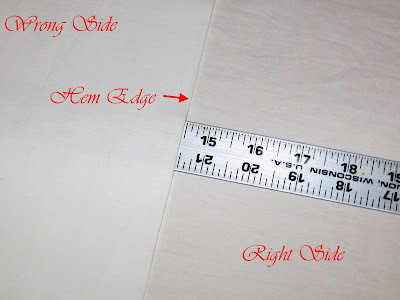 I use a sewing gauge to get the initial length right, measuring from the last seam to the fold. 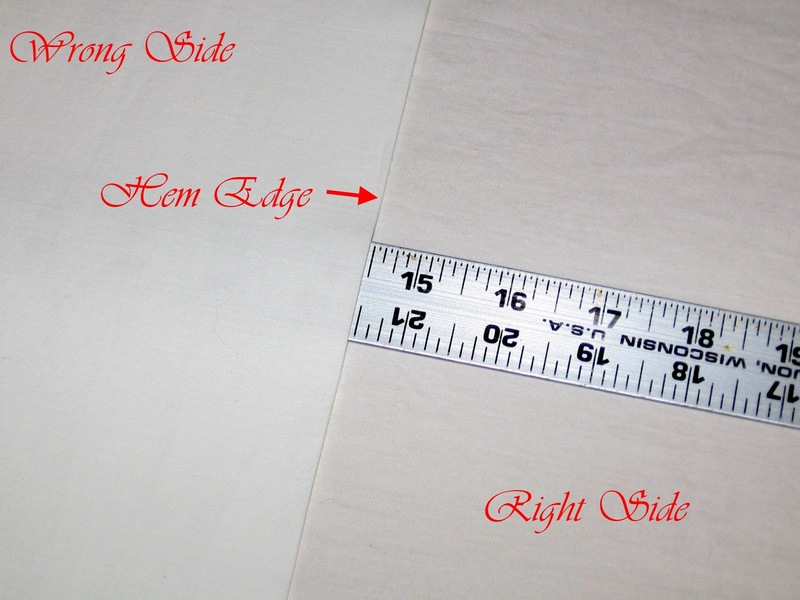 I only use the gauge once to accurately measure what number it brings my hem to on the yard stick I've laid in between the fabric. In this case, by adding my 1.5 inches from the last seam line, my hem line now falls to 14.5 inches on my yard stick. This is how I gauge for the rest of the ironing process. To more advanced sewists than I, it probably seems as though I have taken something very simple and made it very complicated. However, I am very much a "show me" type person, and unless I can be shown hands on or have a detailed pictorial, I have no clue what is going on. I began my tucks, ironing at the 1.5 inch line then running a 1/2 inch seam on the machine to actually create the tuck. I wasn't actually doing a tuck when I took these, so I apologize for not being exact on my fold and things being a little wonky. Things progressed fairly smoothly for me as I continued making tucks up the petticoat, and after doing a couple I started timing myself. To measure, iron, pin, sew, unfold and iron flat each tuck, it takes me about 50 minutes. I don't know if that's good or bad, but I'm pretty consistent with that speed. Then it hit me: I had based all my measurements on the assumption the tucks were .5 inch. Only, based on how I was doing, they were really twice as deep as they should have been, making the original petti's tucks more likely around 1/4 inch. I felt sick. I had been so careful, and now my beautiful petti was all messed up. I don't know why I had assumed .5 inch from the beginning, but looking at the original on the MET's site the only measurement given was the center back length of 44.5". That number alone along with the fact the tucks stopped so low to the bottom should have told me they were smaller than I was assuming, but my brain doesn't work like that. Ugh! I literally mulled over what to do for an entire day. I toyed with the idea of taking all the tucks out and starting over, but that wouldn't be kind to the fabric and would take forever. I pondered continuing as is and having the top of the tucks end in the middle of the petticoat, but I really didn't want them up that high. Or, I could continue as is but leave out the gap in between the two sections and just have a series of tucks going up, which design-wise seemed rather boring compared to that of the original. In the end, I decided to let go of my hopes of recreating the original and going with the third option. I put in the rest of the tucks going straight up the petti all in a row. That's where I have stopped so far, but will begin balancing the waist, gathering the waist and putting on the waist band hopefully sometime this week. At least I don't have to think about tucks or the word "tuck" anymore. Oh what, dear friends, have I gotten myself into? I have been in what I will call a "winter funk" for some time now, compounded by the fact that this is the off-season at the museum so I have not been working since Christmas. Last week I decided it was time to pull myself up by my shoelaces and force myself back into some activities which normally I enjoy, but have been too depressed to participate in as of late. 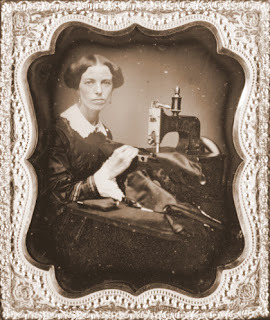 To alleviate my melancholy I set myself to working on a sewing project that will not only keep my hands and mind busy, but also provide me with a beautiful yet functional garment to wear once I return to work. Having purchased 7 yards of beautiful white 200-thread count Robert Kaufman 100% cotton Kona fabric last month with a coupon from Jo-Ann's, I went to work making an over-the-hoop petticoat. I started my project by visiting Elizabeth Stewart Clark's website "The Sewing Academy.com" to print out her instructions on how to make petticoats. I found the guide to making a basic petticoat under the section called "The Compendium", where you can also find several other how-to guides for historical sewing projects. All the instructions are in PDF format, and while I was there I printed out all the other guides to set into a binder for future use. Lovely is the only way to describe it. Even though I hadn't planned on making a tucked petticoat, after seeing this I knew I had to. I wanted to try and recreate the tucking on the original, minus the embroidery in between. Tucks weren't something I had ever done before, so I knew it would be good practice. Unfortunately I must leave you at that. I need to get back to work before I head off to bed, so the rest of this petticoat adventure will have to be continued another time! And They All Lived...Happily Ever After? For this first post on the OLHS Staff Blog, I thought I would share one of the most frustrating things I have encountered whilst doing research for living history programming. As the Senior Vice President of Interpretation at OLHS, one of the many facets of my job is to research and write biographs for each of the characters we will portray during a program. This process begins with pin-pointing which of (usually) several families were actually living in the historic site we will be using during the time period we will be portraying. Historical homes were rarely owned by a single family during their entire existence, so the first challenge is to determine who lived there, and when. Sometimes this information is previously known and handed to us, other times it can actually require quite a bit of digging to discover. While researching the Farnams for our recent program "The Spirit of Christmas Past - A Farnam Family Holiday" in Richfield, Ohio, there were only 4 core family members living in the home during December, 1862. However, due to the large amount of extended family members I had to research, the family tree I created ended up with 441 members on it! For each of those people, I need to know certain key pieces of information, such as when/where they were born, where they lived and when, if/when they were married and had children, occupation, etc. To be a good historical interpreter you need to know your character's life as well as you know your own, and this extensive research helps the OLHS interpreters achieve that goal. When I supply them with their biographs, they can see that they have a sister who lives down the road, but that they also had a brother who died in infancy. They know that their cousin is currently serving in the war, and that their poor widowed aunt has had to take on work as a domestic servant to make ends meet. It's all in the details. However, this is not what frustrates me! (OK, ask me the next time I am awake at 3 AM fretting over the fact I simply cannot find so-and-so's enlistment record and I may state otherwise), but in general doing all this research is fun and exciting to a historical-enthusiast like me. What is not fun is when I come across some really interesting bit of information that we simply cannot use because it did not take place until AFTER the time-period we are portraying! If we are portraying December, 1862 and the event did not happen until January, 1863, I have no choice but to leave it off the character biograph because, to us, it hasn't happened yet. Sometimes the information is so interesting that I actually get frustrated that it can't be mentioned in the context of our program. 1. The character I most recently portrayed was committed to an insane asylum by her own daughter around 1900. There was nothing in the rest of my research to suggest this woman was actually insane; in fact she was very intelligent, but eccentric. She even referred to herself in a diary entry as an "odd bird" because she was a vegetarian, refused to marry without love, was college educated, and was a physician. One can only assume her daughter committed her out of desperation of having such an unconventional mother. Not to worry, in the next federal census she was out of the asylum and living with the same daughter, so I guess they worked out their differences. 2. 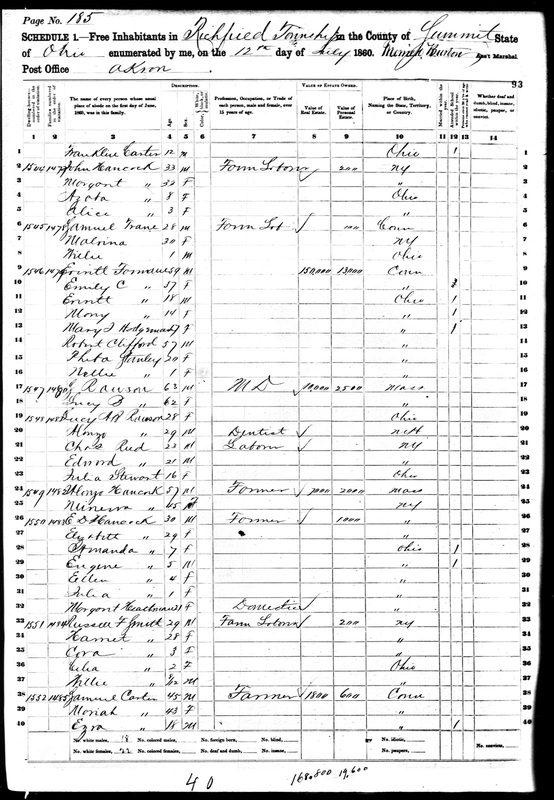 In the case of the Farnam family mentioned above, there was a 20 year old domestic servant working for them on the 1860 census. At that time, she was married with an infant. When I followed her into the future, I could see that eventually she and her husband parted ways, living in different homes in the same small township. It makes one wonder what happened- did they fight? Did he abuse her? Did they get legally divorced or just go their separate ways? How did they interact when their paths crossed living in the same town? What did their neighbors think? (Remember, this was during a time period where death-do-us-part was the norm, no matter the situation.) Their separation did not occur until after our time-portrayal, and even if their relationship had already started to go sour by the program cut-off date, it's not exactly information that would have been spoken of around the family dinner table with guests present. 3. I discovered the husband of a family I was researching ended up committing suicide a few years after our portrayal date. Not that I wanted to actually portray the suicide, but in this case it made me want to reach out and shake the interpreter who would be portraying this man and shout "Don't do it! Your family needs you!" It was hard knowing that this nice man would later be so wrought with grief over the death of his son that he would take his own life. So there are 3 examples of very interesting historical information that essentially went to waste due to program date cut-off restraints. Tidbits like that are like gold in the living history world- our visitors love to hear all the little details that make our characters more human and less like dusty figures from a history book, and in cases like these, they couldn't be used. The only solution- come up with more programs set later in time where they can be included! Come visit for the Yuletide, a time of family, togetherness, love and cheer. 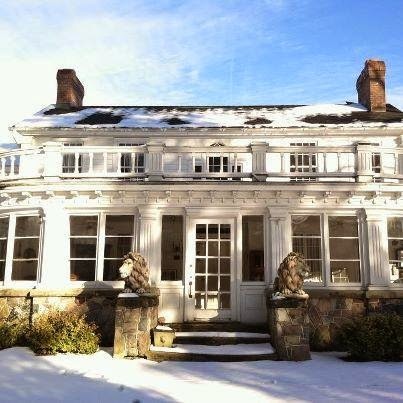 You are cordially invited to visit Farnam Manor for the holidays! According to legend, many spirits linger. You have to feel it to believe it! Experience the energy and ambiance of the historic Farnam Manor adorned for the holiday! Bring your cameras and gadgets! The Spirits love company and want to be noticed! Tours begin at 5:00 and 7:00 PM. Please arrive 15 minutes before the hour. Your visit is about 1 1/2 hours in duration. Space is limited.